North Front Of Tippoo's Palace, Bangalore. bl.uk > Online Gallery Home	> Online exhibitions	> Asia, Pacific and Africa Collections	> North Front Of Tippoo's Palace, Bangalore. Plate nine from 'Picturesque Scenery in the Kingdom of Mysore' by James Hunter (d.1792). 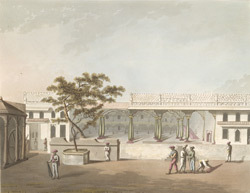 This aquatint is based on a picture by Hunter, and shows the north side of Tipu Sultan's palace at Bangalore. Tipu Sultan (1753 -1799) and his father Haidar Ali (c.1722 - 1782) were the Muslim rajas who campaigned against the British in the Anglo-Mysore Wars of the late 18th Century. The palace (1791) took ten years to build and was used as a summer retreat. It was a two-storeyed ornate wooden structure with pillars, arches and balconies flanked by gardens on either side. The eastern and western projecting balconies of the upper floor contained the seat from where Tipu conducted affairs of the state. An inscription on the wooden screen describes the palace as the 'Abode of Happiness'.